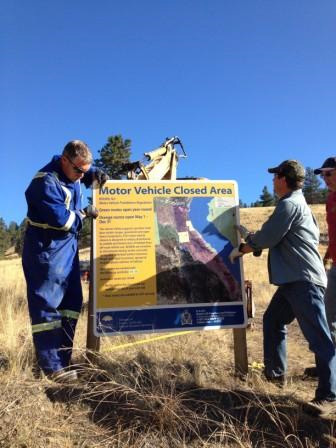 This past week, volunteers from the Summerland Sportsmen’s Association worked alongside the Provincial Conservation Officer Service and the South Okanagan Similkameen Conservation Program in Garnet Valley between Summerland and Peachland, posting new motorized vehicle regulations and restrictions signs as well as marking and deactivating illegal trails. Garnet Valley has some of the Okanagan’s most valuable wildlife habitat, with south-facing slopes ideal for winter and early spring habitat for mule deer. The valley is a beautifully diverse landscape – with sensitive wetlands, grasslands, rugged terrain and open forests. It’s a link for wildlife to move and connect to other important natural areas away from the busy Hwy 97 corridor. With the support of HCTF in the 1980’s, the Province of BC recognized the importance of the Garnet area and purchased a number of private parcels to augment crown land holdings. A significant increase in motorized vehicle damage and illegal trail building over the years has markedly degraded the habitat and resulted in disturbance to mule deer on their winter range. In early 2014, the Province of BC established new Motor Vehicle Prohibition Regulations under the Wildlife Act for Garnet Valley to protect the values. The new regulations for Garnet Valley designate open legal routes and closed illegal routes to protect wildlife and allow habitat to recover. Leading up to the closure, BC Conservation Officers and Forestry Compliance and Enforcement Officers had been providing education and information about the coming changes to the motorized recreation community – now it was time for full implementation. 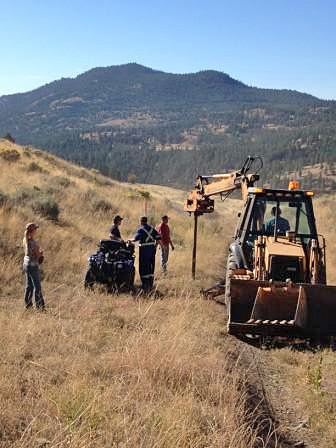 The partnerships forged during a successful PCAF project in 2012 came together once again with the Summerland Sportsmen’s Association, South Okanagan Similkameen Conservation Program and the BC Conservation Officer Service working side by side to assist in the protection of Garnet Valley wildlife habitat. With funding provided by the HCTF Public Conservation Assistance Fund 2014 and in-kind matched by the partners, vehicle closure project was completed during the last week of September. Volunteers and government staff systematically marked the open and seasonally open routes, while marking and deactivating the illegal routes over a number of blue bird fall days. A flat tire on the backhoe was the only hitch in an otherwise seamless project supervised by Sargent Jim Beck of the BC Conservation Officer Service. “The success of our last PCAF project has inspired all of us, the sportsmen’s club, the conservation partnership and the provincial government to keep working together for habitat recovery in the Garnet”, said Bryn White, SOSCP Program Manager. In 2012, HCTF’s PCAF program supported an application from the groups to fence one of the last wetlands in the valley called Ritchie Lake that had been significantly degraded by mud-bogging off road vehicles and cattle. In one year after the wildlife-friendly fence was built, the dry rutted area was unrecognizable. In its place was a beautiful and lush wetland complete with reeds, dragonflies and ducks. This year, the group took some time to sit and have lunch at Ritchie Lake to enjoy the view. It wasn’t long before talk of another damaged wetland area seen in the north end of Garnet Valley came up that would benefit from excluding cattle and mud-bogging off road vehicles. McLachlan Lake looks very similar to Ritchie Lake – pre-fence. It is holding water for the first time in a number of years, and would be a perfect joint project given its location between the Summerland and Peachland Sportsmen’s Club. Stay tuned to hear how they tackle this one. Our thanks to the South-Okanagan Similkameen Conservation Program for providing this update on PCAF Project #1032.